Press Release - Smalley Steel Ring Company NEW Linear Spring Series Now Available in Canada from RotoPrecision Inc.
Now Available in Canada from RotoPrecision Inc.
Mississauga, Ontario: The Smalley Steel Ring Company announces the release of a New Linear Spring Series now available in Canada from RotoPrecision Inc. Linear Springs are produced from spring-tempered wire material that is shaped into waves along the length of the wire. They act as load bearing devices having approximately the same load and deflection characteristics as wave springs but designed for straight line applications as opposed to conventional wave springs which are designed to fit in a circular cavity. 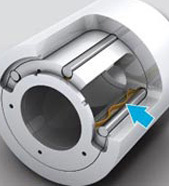 This means a linear spring may be located in an axial direction yet still provide a radial force. 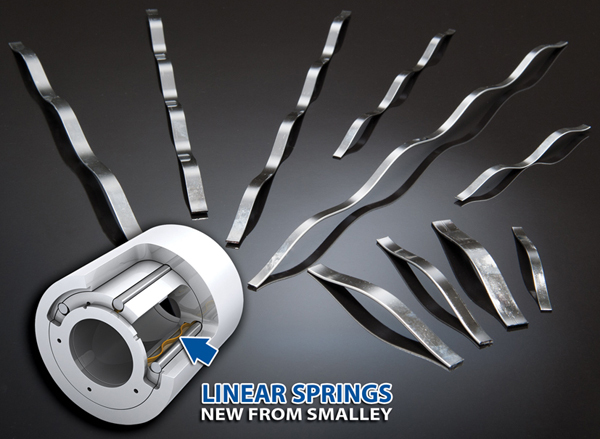 Linear Springs are now available as a standard part from Smalley in more than 200 sizes with stock in carbon and stainless steel. Custom sizes and exotic alloys are also available. There are No-Tooling-Charges™ on special designs. Or please contact Application Support. Smalley Linear Springs are used to load pins that are positioned inside grooves so a rotating element cans detent to specific positions. 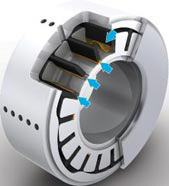 The springs are designed to exert a precise load to give the rotation a desired resistance. Linear Springs are used to radially load the bottom of the vanes in the pump. The springs energize the vanes against the bore for better sealing.